Born premature at 26.5 weeks and weighing only 2 lbs. This is the five month journal of Isla’s stay at the NeoNatal Intensive Care Unit of Mount Sinai Hospital in Toronto, Canada. 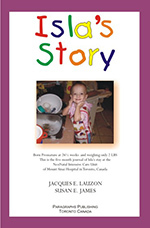 Isla’s Story has it’s own website where you can order books.